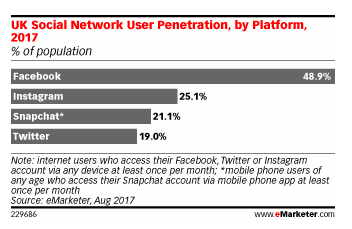 “Both platforms have found success with this demographic since they are more aligned with how they communicate — using visual content,” noted eMarketer forecasting analyst Oscar Orozco in a statement. It’s the second consecutive year of expected usage declines for Facebook among this advertiser-coveted group, according to the researcher. 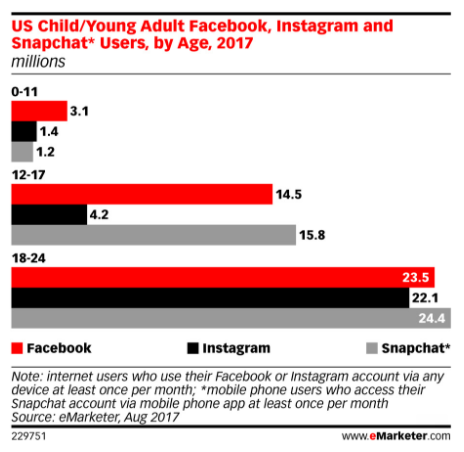 eMarketer suggests some tweens are even skipping adopting Facebook entirely (it calls them “Facebook nevers”) and going straight to the rival platforms, even as remaining tweens and teens appear less engaged on Facebook — logging in less frequently and spending less time on the platform. Back in 2013, when reports of Facebook’s spurned acquisition attempts of Snapchat surfaced, it followed fast on the heels of the company reporting a first-time decline in young teens using its service daily. 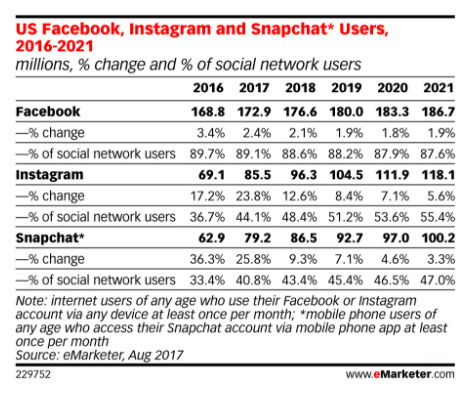 eMarketer couched U.S. Facebook usage in the 12 and 17 age-group as dropping the most “precipitously” — noting that while 81.9% of social network users in that age range are projected to use Facebook this year, the figure will slide to 76.2% by 2021.
eMarketer’s methodology counts a monthly user as someone who is accessing their account at least once per month, consistently, each month throughout the calendar year. It says it bases its forecasts on analysis of quantitative and qualitative data from research firms, government agencies, media firms and public companies, along with interviews with senior execs at publishers, ad buyers and agencies.